A political group is spreading the perception that the country will again become Pakistan if Awami League loses control of Bangladesh. They even suggested a label “Banglastan” for this supposed nation which transforms into an improvised Pakistan in the East. But symptomatically it appears to become another Kashmir, or in a classical sense be called Banglashir (Bangladesh + Kashmir). Prime Minister Sheikh Hasina went to Shantiniketan, India to attend the Vishva Bharati convocation. 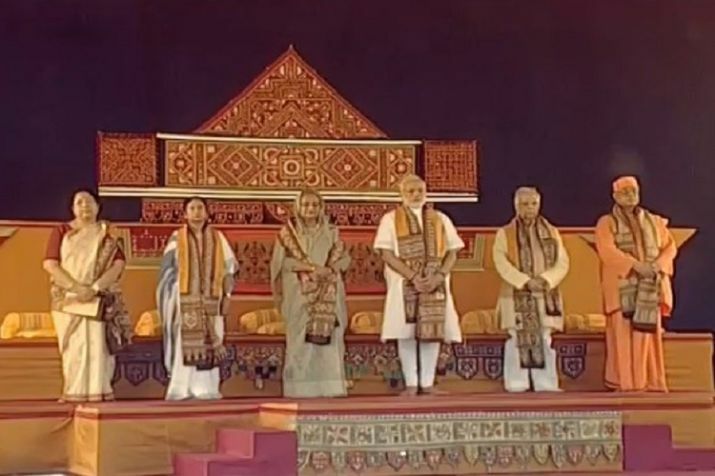 On the same occasion, Narendra Modi joined in as a Vishva-Bharati’s Acharya. Various observers believe this particular rendezvous was orchestrated at an opportune moment to help re-establish a relationship between the two leaders. The media hyped it as viewing a display of the mythical chariots (Ratha Yatra), but the primary objective was to push a package; “how to win the upcoming election at the end of this year once again”; by hook or crook, whatever it takes. On this visit, Hasina propagated the fear of Pakistan and that; her’s is the only party that can be trusted to continue the pro-India mantle faithfully that works out magnificently for India and also gives the power she wants. Indira Gandhi uttered the above sentence in 1971. She used to say that the head could survive pain on one side. But it is difficult to sleep with pain on both sides. Ananda Bazar highlighted a similar statement by Hasina. As there are no comments on this issue from Hasina’s office, it can be assumed to be a true declaration by Sheikh Hasina. Another Sheikh, Sheikh Mohammed Abdullah of Kashmir, also gave away everything without asking for anything in return. He had the habit of being magnanimous in giving more than what he received. People in Kashmir have not forgotten that ever since 1947. In 1947, Sheikh Mohammed Abdullah welcomed the Indian army into Kashmir. He fully supported the document evidencing alignment with India. In exchange, he was able to act as the Chief Minister of Kashmir till 1953. The man who is most responsible for the suffering of people in Jammu and Kashmir, as well as the people of India and Pakistan; is Sheikh Mohammed Abdullah. In the lust for power, these Sheikhs became so blind that, the sufferings of the people never crossed their minds. There were mass killings of about 250,000 Muslims and displacement of approximately 1,000,000 persons in Jammu and Kashmir. In 1953, Sheikh Abdullah realized he made a tremendous mistake by trusting India when his perceived friend Nehru put him in jail. This mistake has caused enormous sufferings for the Kashmiri people for which they are paying till now. They do not see any future in the Indian Federation. All indications are that Bangladesh is proceeding towards the path of Kashmir. By creating the myth of a Pakistani Genie, Bangladesh is being prepared to become another Kashmir. Here, we can hear the sound of another Sheikh’s footsteps. Before the arrival of the British, the Hindus and Muslims lived peacefully in these lands what was India. To effectively administer India, the British devised a “divide and rule” policy between Hindus and the Muslims. It worked out very well for them. They were acting as the judge and the jury while the Hindus and Muslims were fighting. If they did not get tired, the British could have ruled India for another century using the same method. Their “divide and rule” policy created a new dimension of troubles in India. Even before leaving for good, they embedded a seed of enmity between Hindus and Muslims. One of these seeds was the creation of the Kashmir problem. India and Pakistan; even though very poor, were importing arms and ammunition in record levels heeding poverty of their population. Now, both of these nations are very large purveyors of weapons and are two big nuclear powers. British misdeeds have created this enormous enmity amongst peoples that were otherwise living peacefully for centuries. Without the Kashmir issue, India and Pakistan could have lived peacefully. But the British had to leave their legacy behind. Instead of using their wealth for the benefit of their people, they indulged into purchasing arms and ammunition. Otherwise, the region could have achieved unprecedented prosperity. A prolific crusader, Arundhati Roy promoted the cause of Kashmiri independence despite the stereotyped Indians calling her a traitor and wanted her incarcerated. In an interview, Miss Roy said, if the state runs a case against me in the court of law then there should be a case against Nehru (the first Prime Minister of India) even post his death. She mentioned several telegrams and radio addresses by Nehru in which he said; “I declare, the fate of the Kashmiris will be decided by themselves. This promise is not only for the Kashmiris; it is to the entire world. I will never renege from this covenant, and I won’t be able to do it either (3 November 1947)”. For the sake of Kashmir, Pakistan and India fought three wars; 1947, 1965 and 1999. It is incumbent to the parties in this conflict to address issues and mitigate their differences for the sake of peace and prosperity. The people who talk about the European like peace in the sub-continent, somehow are not getting involved deeply in this pursuit. The armed forces of India comprise of about 1,300,000 persons which makes it the third largest standing armies of the world. About 700,000 of their armed personnel are deployed in Jammu and Kashmir. With a population of 7,000,000, this is one to ten ratio and makes it the largest per capita army deployment in the world. Naturally, the expenditures related to this engagement is enormous. If Bangladesh was to be made into a defacto colony, India has to deploy 20 times the soldiers as in Jammu and Kashmir. When India is already over-stressed within Kashmir, where should she be looking into when it comes to Bangladesh? If India thinks Bangladesh will be similar to the peoples of Sikkim and Bhutan, they would grossly misjudge the situation on the ground. In 1947, 90 percent people of the then East Bengal (now Bangladesh) voted for the formation of Pakistan. Bangladeshis got disenchanted with the misrule of the Pakistani ruling class. Even with the commonality of religion, which was initially thought to be viable, now could not keep the Bangladeshis from remaining in Pakistan. The war of liberation in 1971 was the result of the resolve of the Bangladeshis. India must realize, the hatred towards Pakistani rulers is now being diverted against Indian defacto rule of Bangladesh by maintaining Awami League as their proxy. More the Awami League gets through with make-believe elections; the more Bangladeshis will be agitated against India. They firmly believe, the Indian government is behind these fake elections. Anti-India feelings are running high throughout South Asia. Leaving Pakistan alone, one cannot forget Sri Lanka, the Maldives and the people of Bangladesh who are tired of Indian policies. Even the Hindu Nepal is no exception. How long will the peace in Bhutan last is someone’s guess? No one likes anyone to pry into one’s family and nation. People abhor agents of foreign governments. If this hatred magnifies, the scenario in the entire sub-continent may drown into chaos. Various Indian think tanks are already warning about these scenarios. With China encircling India in all directions, one does not have to look in any other direction. Every action has an equal and opposite reaction. When India is playing with her smaller neighbors, a counter activity/reaction is developing. Indian neighbors would rather have China as their friend owing to meddling in their internal affairs by India. Not only that India has pain on both sides; that pain will propagate to every organ of the body. Because of wrong Indian policies, all neighbors are transforming into Pakistan. When the neighboring nations like Bangladesh and India create ties with some political parties and not the people, they focus all their energies on the winning of that political party. With aiding Awami League only, there is already tremendous anti-Indian feelings within the people of Bangladesh. China would gladly work her way into the void. Awami League strengthens their power by exhibiting the fear of the Pakistani Genie. The main opposition party Bangladesh Nationalist Party (BNP} must expose that point in a clear voice. The recent trip to Delhi by the BNP leadership must be clearly explained to the public. BNP must proceed with their political agenda in a transparent, concise manner keeping the people with them at every stage. BNP was in power at a crucial time of Bangladesh when coups and counter-coups were happening every time you look around. BNP is a nationalist party and never converted Bangladesh into Pakistan then, and is not planning for it now. It is transparent propaganda spread by Sheikh Hasina and her party. Creating Sheikh Abdullahs by instilling fear of a ghost of Pakistan, we cannot save Bangladesh from becoming a Kashmir. India must realize this and not put all eggs in one basket. While BNP needs India, India also requires the cooperation of BNP. If the scenario changes, India may have lost their opportunity to maintain a reliable neighbor. Any shortcut way may bring a considerable loss for India as well as BNP. India’s general election is forthcoming. In the last election, Awami League government helped the Congress Party. BJP is fully aware of this. Doubt remains whether Modi government will bring the crocodile by digging the canal. Whether Modi has realized this, it is a matter of guess. “All disciples’ in a temple are not true disciples”; Modi is fully aware of this. BNP and their partners are deeply rooted in various localities outside the capital city Dhaka. At this time, BNP has only one roadmap in front of them. They should not participate in the upcoming polls without the help of a neutral caretaker government; otherwise, it will be another electoral fiasco like 2014 election. Awami League and Hasina know, they are shouldering a burden of illegitimacy and BNP must make sure this burden should crush an authoritarian regime Hasina is running. With firm resolve and clear direction, this fascist government will crumble. Bangladesh is Bangladesh, they are doing way better than Pakistan or Kashmir.